NEW YORK�(CNNMoney) -- U.S. stock futures edged higher Monday, as investors continue to bask in upbeat sentiment following a better-than-expected jobs report. Dow Jones industrial average (INDU), the S&P 500 (SPX) and Nasdaq (COMP) futures all hovered slightly above breakeven early Monday. Futures measure current index values against perceived future performance. "Nothing awful happened in Japan, nothing really changed in Libya that much. There wasn't a massive downfall in the budget process," said John Canally, investment strategist at LPL Financial. " The fact that we got through the weekend with none of that, and people are still reflecting on the good jobs report, is sending futures higher." On Friday, U.S. stocks started the first day of the second quarter with modest gains, helped by the government's stronger-than-expected jobs report. Few major economic reports are on the agenda this week, and fund managers expect stocks to hold steady as investors hold out for the start of earnings season later this month. Economy: No market-moving economic reports are on the agenda Monday, but investors will keep a close eye on comments from Federal Reserve Chairman Ben Bernanke in the evening. Bernanke is scheduled to speak on "Clearinghouses and Financial Stability" at a financial markets conference in Atlanta at 7:15 p.m. ET. Investors will also listen for comments from Atlanta Fed President Dennis Lockhart and Chicago Fed President Charles Evans, who are speaking throughout the day. As food and energy prices have surged over the last two months, investors are wondering if the Fed will consider raising interest rates to combat inflation sooner rather than later. They will be looking for hints from Fed officials this week, especially as the Fed's overseas counterpart, the European Central Bank, meets on Thursday to discuss a change in its monetary policy. "The inflation issue is going to be a thought on people's minds," said Mike Wall, CEO of Wall Financial Group. " Investors are concerned about inflation and how it's going to affect their dollar." Companies: General Electric (GE, Fortune 500) shares rose 1.5% in pre-market trading Monday, after a Barron's article -- citing a Citigroup analyst -- noted that GE may not be liable for financial damage in Japan's nuclear crisis. Southwest Airlines (LUV, Fortune 500) shares fell nearly 5% in pre-market trading. The Texas-based airline canceled about 600 flights over the weekend, after a hole opened on top of a Boeing 737 mid-flight Friday. Southwest expects to cancel another 100 flights on Monday to accommodate aircraft inspections. Pfizer (PFE, Fortune 500) shares rose 1.1% in pre-market trading, after the drugmaker announced it will sell its Capsugel unit to Kohlberg Kravis Roberts & Company (KKR) for $2.375 billion in cash. World markets: European stocks hovered around breakeven in morning trading. Britain's FTSE 100 gained 0.2%, the DAX in Germany was flat and France's CAC 40 fell 0.1%. Asian markets ended the session higher. The Hang Seng in Hong Kong rose 2.7% and Japan's Nikkei ticked up 0.1%, while the Shanghai Stock Exchange was closed for a holiday. Currencies and commodities: The dollar rose against the euro, and fell versus the Japanese yen and the British pound. Crude oil for May delivery fell 3 cents to $107.91 a barrel. Gold futures for June delivery rose $8.30 to $1,437.20 an ounce. 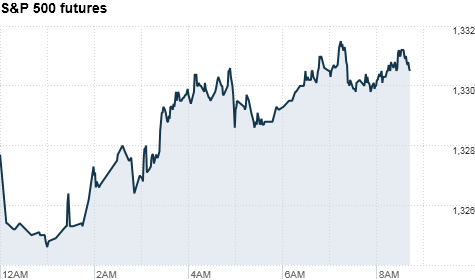 Bonds: The price on the benchmark 10-year U.S. Treasury fell, pushing the yield up to 3.47% from 3.45% late Friday.